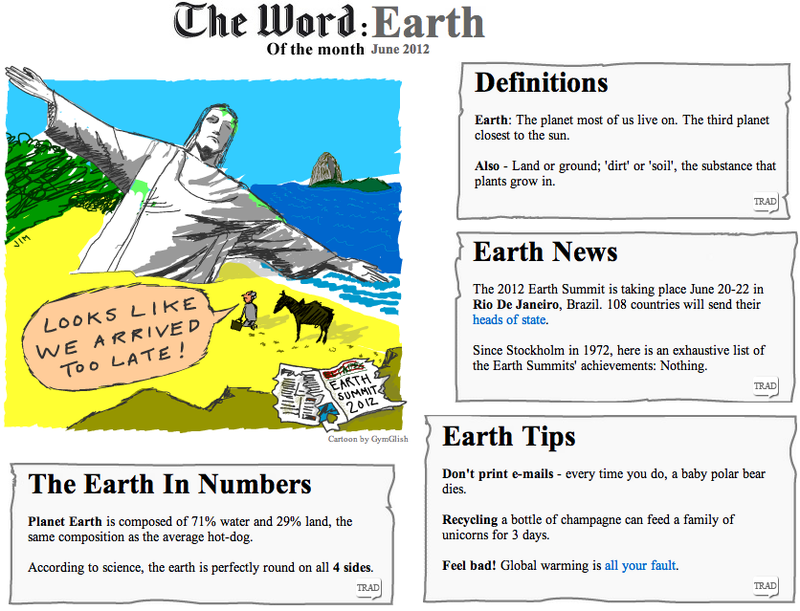 Earth News – The 2012 Earth Summit is taking place June 20-22 in Rio De Janeiro, Brazil. 108 countries will send their heads of state. Since Stockholm in 1972, here is an exhaustive list of the Earth Summits’ achievements: Nothing. Earth Tips – Don’t print e-mails – every time you do, a baby polar bear dies. Recycling a bottle of champagne can feed a family of unicorns for 3 days. Feel bad! Global warming is all your fault. Quelle bonne idée ! Vos cours sont géniaux ! Je suis persuadée que je ferai de réels progrès.